Kofi Annan (1938- 2018) - Former UN Secretary-General and Nobel Peace Prize Laureate. Gro Harlem Brundtland (Acting Chair) - First female Prime Minister of Norway. Martti Ahtisaari - Former President of Finland. Ban Ki-moon - Former UN Secretary-General, former South-Korean Foreign Minister and diplomat. Ela Bhatt (Elder Emeritus) - Founder of the Self-Employed Women’s Association in India. Lakhdar Brahimi - Former Algerian freedom fighter, Foreign Minister and UN diplomat. Fernando H Cardoso (Elder Emeritus) - Former President of Brazil. Jimmy Carter (Elder Emeritus) - Former President of the United States. Hina Jilani - Founder of Pakistan’s first all-women law firm and international human rights defender. Graça Machel - Former Minister of Education and Culture in Mozambique. Mary Robinson - First female President of Ireland and former UN High Commissioner for Human Rights. Desmond Tutu (Elder Emeritus) - Archbishop Emeritus of Cape Town. Ricardo Lagos - Former President of Chile. Ernesto Zedillo - Former President of Mexico. Today, more than ever, we need far-sighted leaders who can see beyond their national boundaries and beyond the next election. The Elders are independent and free from the constraints of office, so they can draw on their own experiences of leading positive change. They are committed to empowering the voiceless and the marginalised, especially women and young people. Working both publicly and through private diplomacy, the Elders engage with global leaders and civil society to help resolve conflict and address its root causes. They challenge injustice, promote good governance and inspire ethical leadership. The Elders came together after a conversation between Richard Branson and the musician Peter Gabriel. They talked about how communities look to their elders for help, particularly when it comes to resolving disputes. Could this be scaled up to suit our modern world? In a ‘global village’, could a small, dedicated group of people use their collective influence and know-how to tackle some of the world’s biggest problems? Richard Branson and Peter Gabriel took these questions to Nelson Mandela, and he said yes. 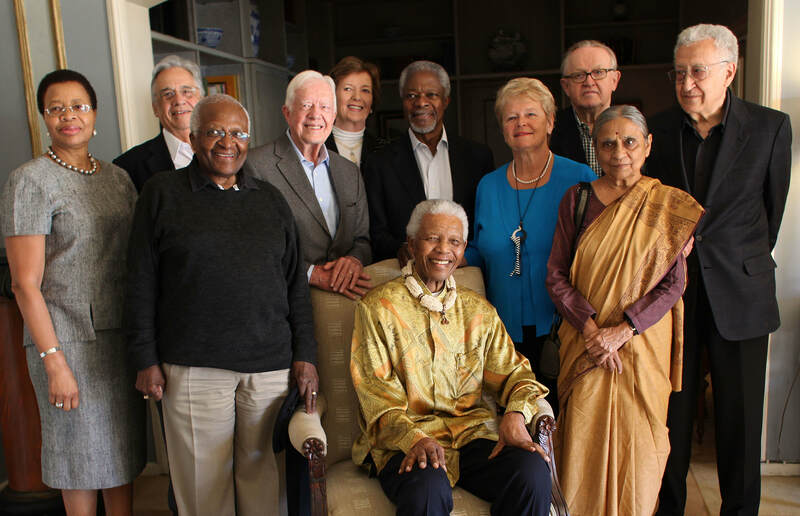 He enlisted the help of Graça Machel and Desmond Tutu to bring The Elders to life. And with the support of a great group of partners Virgin Unite had the privilege of incubating The Elders. It launched officially in 2007. What has The Elders achieved so far? Since their inception, the Elders have worked to help build peace and heal divisions in Côte d’Ivoire, Cyprus, Egypt, Iran, Israel and Palestine, the Korean Peninsula, Myanmar, Sri Lanka, Sudan and South Sudan, Syria, and Zimbabwe. Thematic areas of work include climate change, the empowerment of girls & women, the strengthening of the United Nations and campaigning for Universal Health Coverage (UHC).